Martin Jol will assess Emmanuel Frimpong’s situation at the end of the season. Fulham manager Martin Jol has praised Emmanuel Frimpong for his performances during his time on loan with the club from Arsenal, but does not yet know if they will be able to keep him beyond this season. Speaking to West London Sport, the Dutchman hinted that he would like to make the Ghanian midfielder’s move to Craven Cottage permanent. The former Tottenham boss also had a sly dig at Arsenal, suggesting that with his toughness and aggression Frimpong is not a ‘typical’ Arsenal player. “You couldn’t say that Frimpong is a typical Arsenal player,” he said. “He is aggressive – a little warrior – but he is very young and I feel he has a very good future ahead of him. “He was a very good option for us. We were a bit under pressure and we needed midfielders. “In hindsight we are very happy he is here. He has played his part. Not a big part, but a part. “There have been no talks yet – the season hasn’t finished. 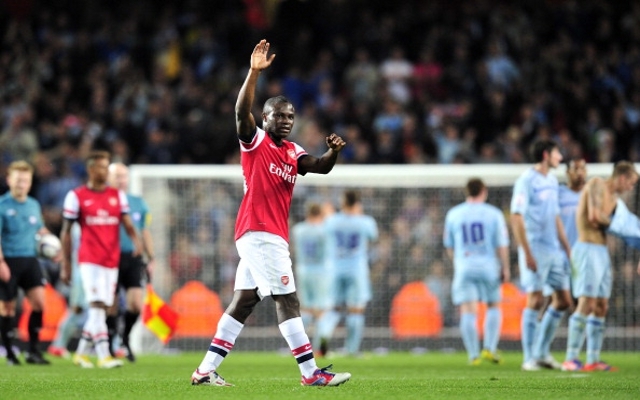 Frimpong is highly thought of at the Emirates Stadium, but injuries have kept him from mounting a real challenge for a first-team spot. He had another impressive spell on loan last season with Wolves, but that was cut short – again due to an injury. Arsene Wenger is rumoured to be in the market for a new defensive midfielder this summer, so it may be that Frimpong doesn’t feature in his plans, in which case Fulham would have a good chance of signing him if they choose to do so. The two sides will meet each other in the Premier League this weekend.